In a previous post, Power Meters Explained, we went over some of the benefits and uses of a power meter, also providing a quick review of the popular models available. Now we will dive deeper and discuss the Mean Maximal Power (MMP) chart and its many uses. 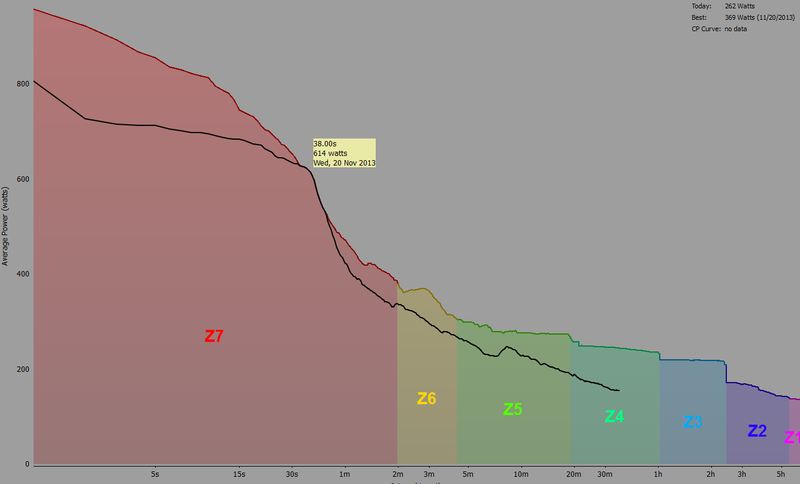 The power duration curve represents the maximum power you can produce on the bike over each duration of time. This horizontal axis is logarithmic time, which allows you to see relevant changes in power more clearly. 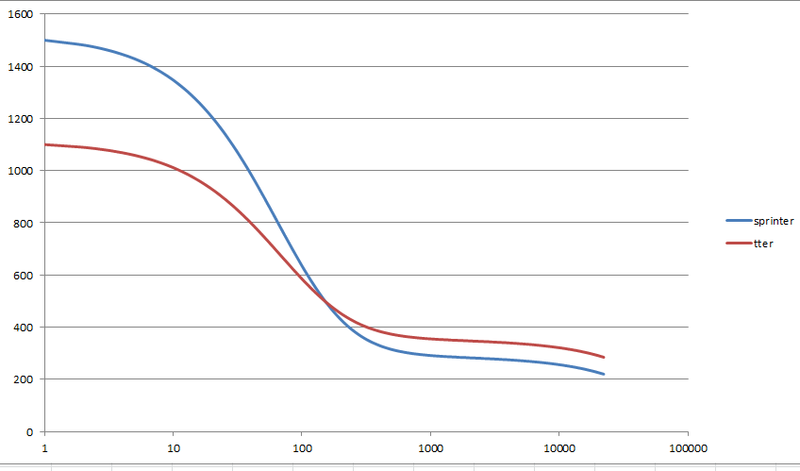 Most cyclists will have a power duration curve shaped somewhat like the example above. For periods of about 1 to 10 seconds, you can produce a huge amount of power using primarily the phosphogen energy system, shown in red. Then there will be a steep drop-off in your sustainable power from there to about five minutes, when power production is dominated by your anaerobic energy system. 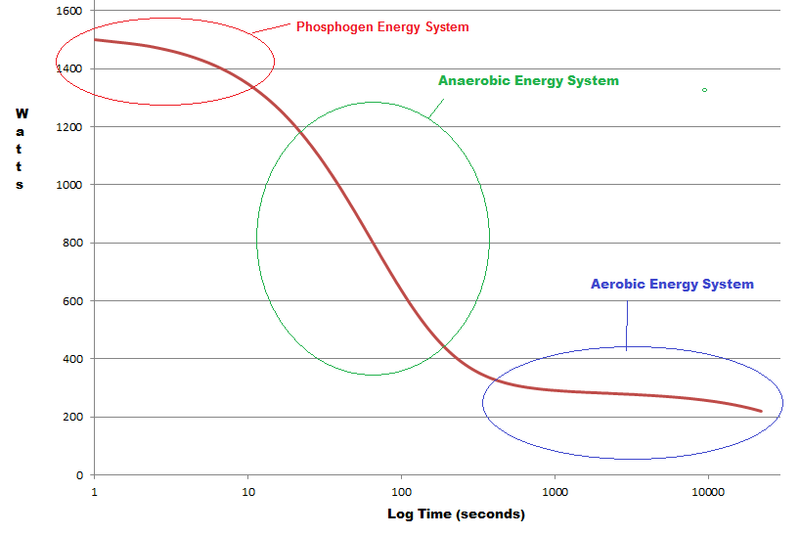 Anaerobic capacity is a fixed amount of energy, lasting only a few minutes. Hence the steep decline in sustainable power in this region. As your sustainable power levels off, power production is dominated by the aerobic system, which is almost indefinitely sustainable, with a slow, gradual drop-off as the duration goes on for hours and hours. Knowing how these three energy systems interact, you can predict how much power you should produce at any duration, as long as you have enough data to have an idea of how your own power duration curve is shaped. The MMP chart looks at the most power you have ever averaged for each given amount of time. It scans through all the training files you specify, finding your best ever one-second power, two-second power, and so on all the way out to your longest ride. This functionality is available in many power analysis programs, including Training Peaks, WKO, and Golden Cheetah. If you have done all-out efforts over many different time periods, your MMP chart will look very much like the example above. 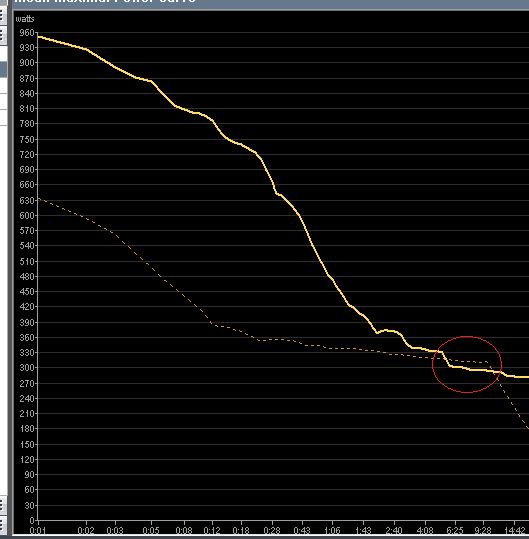 If your data is sparse you won't get a clear picture of how your power duration curve is shaped. Below are two examples. One is an MMP chart with data from many rides; this data includes hard sprints, hard anaerobic efforts, and hard long-term efforts. Note the resemblance to the theoretical power duration curve. On the right is an MMP chart with sparse data. The rider has done no all-out sprints, so you don't see the sharp decline in the anaerobic zone. If you want to have a good idea of what your power duration curve is, you should periodically do all-out efforts in each zone that you are interested in. Once you have a good set of data in the MMP chart you can use it to identify strengths and weaknesses. Sprinters will naturally have very high power in the 1- to 30-second range. Good lead-out men or pursuit and kilo riders will have a huge anaerobic capacity, while long-distance TT specialists and mountain climbers will have big power in the aerobic range. This is the same concept as power profiling but with more refined detail. In the chart below, you can see the difference in the shape of the power duration curve between someone who might be a good cat 2/3 sprinter, and someone who might be a good cat 2/3 time trialist or triathlete. A bike racer might use this data to decide he needs to work on his sprint, or he may decide his sprint is hopeless and focus his tactics on breakaways, or switch to triathlon! By using date filters you can overlay different sets of data onto one chart. If you load up the day's ride on top of all your previous rides of that season, you can see if you have broken any personal records at a glance. In this example below from WKO+, the dark yellow line represents an athlete's entire season of data, and the dotted line represents a single ride. With a quick look, the athlete can see that he set a new all-time best power in the 10-minute range, highlighted in red. Here is another example, using the MMP functionality in Golden Cheetah. The selected ride's MMP is shown via the black line, while the colored line represents the entire season of data. Again, at a glance the athlete can tell that a new sprint power record was set in the 30-second range. 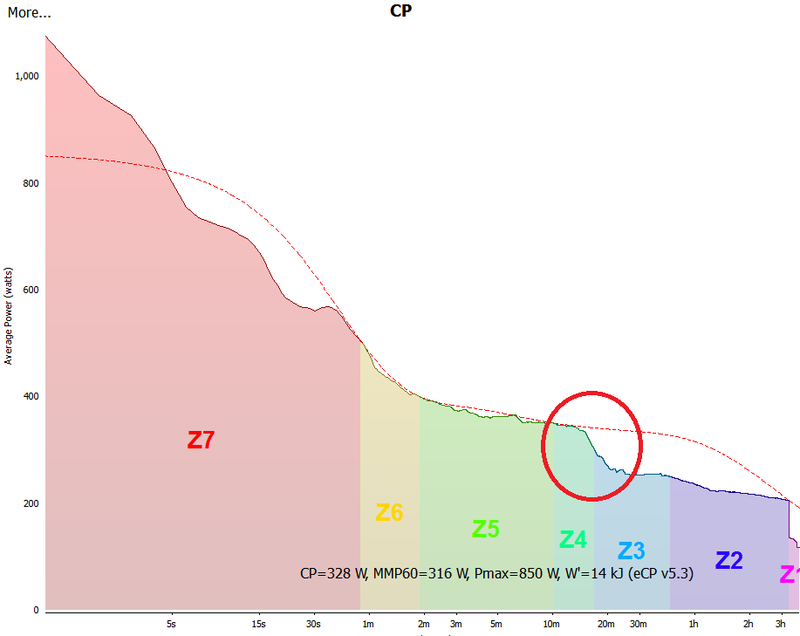 The shape of the day's MMP chart can quickly tell you how hard or easy a ride was, and what the nature of the ride was like. After a group ride or race, you can load up that day's effort and compare it to the rest of your season and see if you have set any new records. New records in the longer durations would suggest your FTP might have gone up. Once you have a good amount of power data, you will be familiar with your own personal power duration curve and can often guess what your FTP (or approximately 60-minute power) is by looking at your MMP chart. For example, take the athlete's MMP data below. This athlete did an all-out time trial of about 17 minutes, but has no recent data for hard efforts longer than that. The sudden drop-off in power is circled in red. If she wanted to guess at her FTP, she could just eyeball the general curve out to the one-hour mark, or use the power duration model built into Golden Cheetah to predict it (dotted red line). Don't trust these kinds of models blindly, however, as they depend on sufficient data and are not perfect! Another tool you can use to guess at your FTP, or sustainable power for any duration, is to use normalized power (NP). Maybe you haven't done a steady, all-out one-hour effort yet this season, but you have done plenty of hard group rides or bike races of around an hour in duration. The stochastic nature of these efforts will not result in your best possible average power, but you can use NP to estimate what an equivalently hard steady state effort's power would have been. Most power analysis tools can display the MMP chart using average power or NP. Again, don't trust NP blindly, as it can sometimes overestimate your sustainable average power. By glancing at your MMP chart in both Average and NP form you can usually get a good idea of whether your aerobic power is on the rise. With experience, you will learn if NP tends to overestimate for you. Extrapolating your power duration curve from your MMP charts allows you to set power goals for intervals or events of any duration and estimate your current FTP, even if you haven't formally tested it.